Eco-friendly designs. Manufacturers are looking to natural materials like shells, stone, bamboo, grass, etc. to create products that offer great design and the appeal of sustainability. The Hanalei Bay by Forecast (at left) is part of the Organic Modern Collection with an inner shade made of bamboo. Mid-century modern. For many, this is hardly a trend, but a style and taste. But for areas like Sacramento, many of the homes present a vibe from the 50s and 60s, and designs from Herman Miller can fit right in. 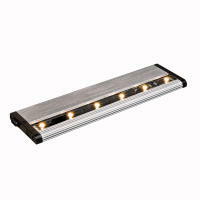 Fluorescent and LED lighting. Technology has come a long way, allowing LEDs to emerge in home lighting in less-than-expected places. For example, Kichler’s Design Pro LED Undercabinet Light (left)allows you to configure the lighting to your particular needs, offering a thin profile and high brightness to add energy efficiency and ambient lighting to your kitchen. Drum shades. These shades are round, big, and, well, drum-like. You can find them in just about any fabric your heart desires, including your own if you just can’t find the right color and style among a manufacturer’s options. 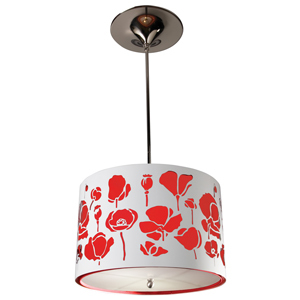 Drum shades have also evolved to combine laser-cut metal along with gorgeous fabric, such as the Poppies Drum Pendant by Stonegate Designs. To read the full article in the Sacramento Bee, click here.